The word "conservative" has evolved in common usage from an adjective into more application as a noun. If I am a member of the "conservative movement," I am considered to be a "conservative." Along with that I find that there is a list of assumptions pigeon-holing me so that I must be easily classified as one who is opposed to all things "liberal." "Liberal" on the other hand has evolved into a term for many "bad" things that "conservatives" oppose. The "us" and "them" camps are currently defined in media and education in this fashion which clouds reason and mires debate. It was not always this way. Further, an understanding of the illustrious past of the word "liberal" reveals that many who are proud to wear the name "conservative" now, would probably have considered it an insult not to be called a "liberal" in our not too distant past. The classical liberal only personally gives away his own stuff. He sets an example for others. He may even encourage others to follow his example, but he would never consider coercing others to give away their own private stuff. In many instances he is even secretive about giving away his own stuff, believing his reward will come from Something, or Someone who knows and sees what he is doing. "And your Father who sees in secret will reward you openly" [see Matthew Chapter 6 in the Bible]. The modern liberal, when he is functioning at peak efficiency, will make every attempt to appear truly charitable while he gives away only other people's stuff. In some cases he will seek out ways to give stuff to people who may not yet know they want it or need it. This aspect will not be discouraged even after many years of proven failures heaped sky high. He will even try to "help" fund government-controlled schools partially for the purpose of "informing" the "unwashed masses" with regard to just how much of his "help" they need. With the help of tenure his counterpart in the educational establishment will defend to the death his right to teach ideas which have been proven unworkable for centuries as if they were new and absolutely valid. The last theoretical stronghold of global communism is the tenured university chair in America, which is not to say that communism is otherwise truly dead in the rest of the world. Of course there are hybrid conservative/liberals about. There are those who are torn between private and public charity. There are those within the Republican Party who consider themselves to be staunch "conservatives" but would not blush as they describe how the Republican Party is the party that "saved social security." They wouldn't be caught dead saying that the Republican Party "saved socialism in America." However, for those who not ignorantly equate social security [another oxymoron] with socialism, that is exactly what they have already said and they openly brag about it. Only total ignorance of the fundamentals of original American philosophy could make social security sacrosanct. Those who don't understand how unearned "benefits" can destroy have only to watch the further decay of our urban areas as "government" continues to wage its "War on Poverty." In the pages of lexrex.com you will see how a careful study of a younger and more candid FDR will refute social security. Don't let memorials fool you. A basic law of political economics is that you get more of what you subsidize - less of what you tax. Has America been indirectly subsidizing poverty by waging a so-called war against it? I wonder how much "ignorance" we can "find" or create as we continue to fund the Department of "Education." The "Conservative Movement" is also an oxymoron grammatically speaking. If it is "conserving" or defending an absolute position philosophically, how does it "move?" Are we all slow dancing together toward the left as the Democrats lead? In the last few years the "conservatives" would seem to be more reactionary than creative in their approach to modern political problems. The so-called left accuses. The "right" apologizes and tries to justify a position that is gradually moving in the socialistic direction toward the left. The "right" continues to drift toward the "left" at a rate that will hopefully keep the public from perceiving the fact that both are drifting in the same direction. One was just drifting earlier. If we try to revert to the old adjective form, we would be trying to identify what noun applies to those who love to be called "conservative." We can agree, almost no one wants to be called a "conservative socialist." If we are not going to "conserve" socialism what can we settle on preserving? Why not open up the dialogue and return to our American roots so we can intelligently decide what to keep or "conserve?" Let's get into the word "conservative" itself. What does it really mean? Is it a noun or an adjective? Surely, in the past it was an adjective but what has happened? Can we make valuable comparisons? The real purpose of this article is to show how a specific anomaly in semantics points to an underlying and very serious condition, and to offer concrete solutions. We have been gradually losing our heritage, partially through neglect and partially by design. The evolution in language that we have outlined here is a symptom of a pervasive and dangerous disease. We don't really need to identify anyone, including ourselves, as coming from the left, the right, or even the center. What we do need most desperately is to return to the rule of law under our founding principles. Their generation had fastened down the meanings of a great many terms that apply to a government of law and not of men. Do you wonder why Bill Clinton, Al Gore or even "W" don't often quote the Founders and Framers in comprehensive context? Is it not the case that de facto government has wondered so far from the beaten path that it is in their best interest for the current ignorance to prevail? In fact, it becomes an absolute necessity when you are attempting to substitute tyranny for liberty. Pick a contemporary argument and lay it alongside the writings of the Founding Fathers and the Constitution, or, pick an economic concept being advanced by your favorite demagogue and compare it to the writings of Frederick Bastiat. You will soon see that the old maxims and rules that were formerly embodied in something they once called "common sense" will quickly put down most of the cartoon characters we called elected officials these days. Please don’t let your own ignorance keep you in a vulnerable position! Start studying lexrex.com until you can articulate American solutions. Don’t be a dupe or an operative! Be a well-informed and well-armed American Patriot! 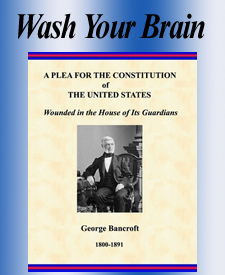 Conserve your blood-bought American Heritage once you truly comprehend it. Suggested reading: "The American Ideal of 1776."